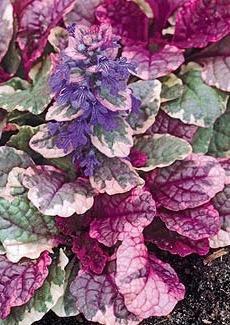 Semi evergreen matt forming spade shaped leaves variegated with pink, plum and cream marbling. Short stout spikes of deep blue flowers, April to May. Sun or semi shade. 15cm tall. Excellent for containers.